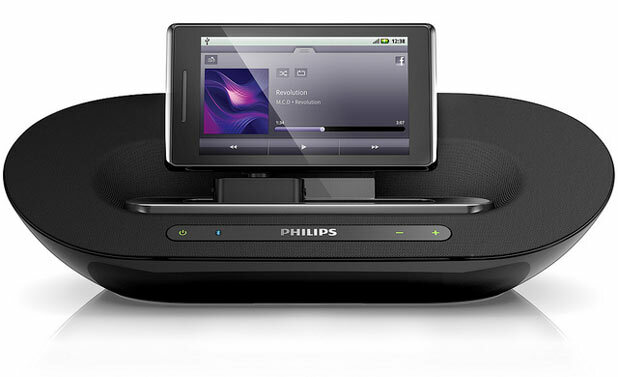 Philips has unveiled its Fidelio range of docks for Android devices. The stations utilise Bluetooth pairing and an app for playback, and come in three different models with varying specs. Philips' high-end Fidelio AS851 features a 30-watt output and the firm's own proprietary digital sound processing. The flagship device is priced at £200. The Fidelio AS351 is a cheaper alternative at £130. It includes 10 watt output with dynamic bass boost to preserve low tones. A budget model, the Philips Fidelio AS111, is also available for £70, designed to serve as a bedside dock. "Philips is adding to its successful series of Fidelio docking speakers with a new range for Android smartphones and tablets, which will be launched at IFA," read a Philips statement. "The Fidelio docking speakers for Android are based on the same speaker systems as the Fidelio for Apple range, so you can be sure to enjoy a stunning sound from your Android phone or tablet but with all the functionality you need for a simple experience." Philips' Fidelio docks allow Android users to charge their handsets and connect via Bluetooth, rather than relying on a line-in method. The Philips Fidelio docks are compatible with both tablets and smartphones.